Buon giorno and welcome to Stefano’s RomeCabs, Rome’s leading company for private Rome Sea Port Civitavecchia Transfers as well as Cruise Port Tours. In this travel blog we go over the 4 types of Rome Sea Port Civitavecchia Transfers, with tips and advice for each type of transfer for a seamless, efficient, and enjoyable transfer experience. From Fiumicino Airport you have 2 options going to Civitavecchia: Going directly to your cruise ship for same day departure, or going to a Hotel Accommodation in Civitavecchia prior to your cruise departure. * TRAVEL TIME: From Fiumicino Airport to Civitavecchia travel time is about 1 hour. Simply book a transfer from FCO Airport to Civitavecchia and provide all your flight arrival details, and drop off cruise ship name. Follow detailed instructions (and watch the VIDEO) on How to meet Driver at FCO Airport. If you haven’t arrived at FCO Airport yet, watching the video will help you visually familiarize yourself with the area where your driver will be waiting for you. Booking a transfer from FCO Airport to a hotel in Civitavecchia is very easy: just book a regular transfer from FCO to Civitavecchia, and instead of the Drop Off Ship Name, please include your Drop Off Hotel Name and Address in Civitavecchia. The price is the SAME whether you will be going to the cruise ship or a hotel in the city of Civitavecchia. Plan to book an Early Morning Flight Arrival at FCO Airport in order to allow you plenty of extra time in case you experience flight delays, or delays at the airport (in customs or baggage claims). By booking your flight too close to the time your cruise ship departs, you risk missing your ship if you experience any unforeseen delays. As there is quite a bit of walking from the baggage claims carousels where you collect your luggage to the Main Waiting Hall where you meet your driver, and then additional few minutes’ walking distance to the Designated Parking Area where your vehicle will be parked (as mandated by Airport Security), be sure to use the Luggage Trolleys available near the baggage carousels. For travelers with mobility issues, be sure to request in advance via your Airline “Complimentary Wheelchair Assistance” so an airport staff member will meet you with a wheelchair when you deplane, and assist you all the way to the parked vehicle. ENHANCE YOUR TRANSFER WITH A PRE CRUISE TOUR! Don’t sit in your hotel all morning waiting for time to pass until your transfer to Civitavecchia when you can be enjoying more of Rome, or explore the magnificent Roman countryside on our Pre Cruise Tours of Pre Cruise tours of Rome or Roman Countryside. Pre Cruise Tours of Rome and Roman Countryside are tailored to fit into the embarkation time of your cruise ship. It includes morning pick up from your hotel, tour by car in your private deluxe vehicle and personal English speaking Driver, and drop off right by your cruise ship in time for your embarkation. Wish to save money on your Civitavecchia Transfers or Pre Cruise Tour, but prefer the benefits, flexibility, and predictability of private transfers and tours instead of being crammed together in a van with complete strangers in generic shuttle services? You may do what tens of thousands of Cruisers do each year: Create your own Privately Shared Civitavecchia Transfers or Pre Cruise Tours with fellow cruisers, and make new friends while sharing the costs. It’s easy to do! Scroll down this page to PRIVATELY SHARED TRANSFERS AND TOURS below for detailed how to information. Recommended Pick up time: 8:00 AM – 9:00 AM is when most cruisers are disembarked by. 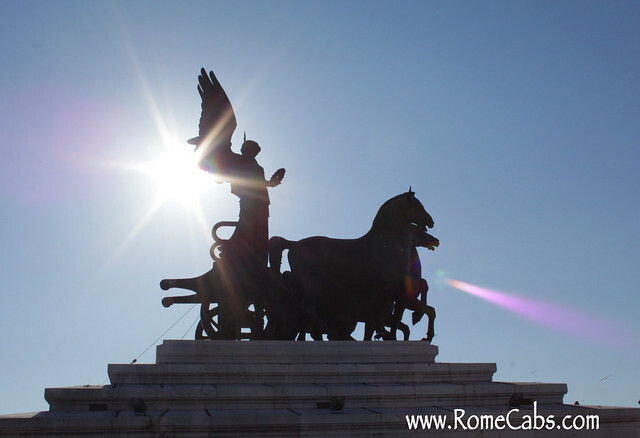 Staying in Rome for just a day and whish to make the most of your holiday? We offer Rome Post Cruise Tours of Rome and the Countryside that are very popular with cruisers who are staying in Rome post cruise and wish to see and do as much as possible effortlessly, and in comfort and style. Below are the most popular Post Cruise Tours that start with Pierside pick up from your cruise ship, and end at your hotel accommodation in Rome. You may also create your Privately Shared Civitavecchia to Rome transfer, or your Privately Shared Post Cruise Tour as well to share the fun and save on your transfers and tours! TRAVEL TIME: approximately 1 Hour. Recommended safe flight departures is 11 AM the earliest so you have plenty of time in case your ship docks late or you experience unforeseen delays on your way to Fiumicino Airport. Also be sure to secure early disembarkation with your cruise ship so you will be among the first and earliest to disembark so you can swiftly be on your way to the airport. You may also create your own Privately Shared Civitavechia to FCO Airport Transfer with fellow cruisers also going to Fiumicino Airport or Fiumicino Hotel. After clearing customs and collecting luggage in baggage claims, exit to the Main Waiting Hall and proceed to the Designated Driver Waiting Area marked by multiple large columns. Your driver will meet you in the lobby of your hotel. Your driver will meet you at your address, at the outside entrance door. If your accommodation is on a street or in a square that is restricted to traffic, your driver will park as close as lawfully possible, will meet you at your address on foot, and then assist you to your parked vehicle. Your driver will meet you right on the Pier next to your ship where all drivers will be waiting for their clients, holding a sign with your name. Do NOT take any buses or shuttle away from the pier area! It’s easy to create your own privately shared Civitavecchia Transfers! Invited other ship mates who require similar pick ups and drop offs as you to share your transfers. Civitavecchia Shared Transfers: The way YOU want them! We invite you to visit our informative travel blog below in 10 tips on Tour Sharing for pre cruise and post cruise tours, as well as shore excursions from Civitavecchia, Naples or Livorno cruise ports. Buon giorno and welcome to RomeCabs Travel Blog! Sharing Transfers to and from Civitavecchia Cruise Port has become an option for many travelers to share costs. In this travel blog we show you How to be in Control of your Shared Civitavecchia Transfers with RomeCabs. Unfortunately many generic shuttle services mean unpredictable pick up times, unpredictable wait times, unpredictable number of persons in the vehicle, unpredictable number of stops around Rome hotels or multiple cruise ships….it’s by and large an unpredictable experience. If you are arriving at the Airport and experience delays in customs or baggage claims (which often happens at Rome’s airport! ), your shuttle service may not wait for you – after all, they have other passengers sharing the same vehicle you were supposed to be on that don’t want to wait on you. Many travelers would like the option of a cost saving shared transfer to and/or from Civitavecchia, but with the benefits of a private service: predictable pick up time, no wait times, knowing in advance how many people will be in the vehicle, and not being crammed in with strangers. Imagine if YOU are in charge of who shares your vehicle. Imagine if YOU are in charge of the total number of passengers in your vehicle for YOUR personal comfort and space. Imagine if YOU scheduled the pick up time and knew when to expect your driver. Imagine if YOU knew your driver’s route in advance. All of the above are possible on your next Civitavecchia Transfer with RomeCabs, and it’s EASY!! It’s important also to consider which transfers are best shared and which are best private. Private transfers are best for Airport Arrivals. It is difficult to organize a transfer with others to arrive at the airport at the same time (or close). Add in situations like missed connections, flight delays, lost luggage, and you will realize a shared transfer is not the best option for arrival transfers. By far the best way to organize your shared transfers is through Cruise Critic where you will find thousands of members, many who may also be cruising on your same ship! Finding fellow cruise mates with similar itineraries is easy on a ship that accommodates thousands of cruisers. If you’re not already a Cruise Critic member, this is a good time to sign up. Once your travel plans are all set, place an ad on Cruise Critic Roll Call and invite other follow cruisers to share your specific transfers. it’s important that all parties stay at centrally located hotels in Rome. Not only you save time while everyone is collected or dropped off at their respective hotels, but the fee for additional hotels are minimal when everyone’s hotels are centrally located. Make sure that everyone is flying out of the same airport (usually Fiumicino Airport, less likely from Ciampino Regional Airport). Choose a pick up time at least 3 hours prior to the first flight departure so the party leaving first will arrive at the airport on time, and those flying out later have the option to wait at the airport as needed. There is no extra fee for multiple terminal drop offs. Anyone staying at the Airport Hotel? No problem, that counts the same as going to the airport. ** Do NOT organize shared transfers if some persons need to go to Rome and others to Fiumicino Airport. Fiumicino Airport is about 40-60 minutes away from Rome, and this extra leg adds the equivalent of an additional airport transfer from the airport to Rome to drop off the rest of the party. It is not cost effective, and the party going to Rome will have to endure a 2 – 2.5 hour drive. Organize shared transfers with everyone going TO, or leaving FROM the same cruise ship. Because some ships may dock at different times, or experience delays, you don’t want your group split up – especially if you have to travel to the airport for a flight. The maximum capacity per vehicle is 8 passengers, and total of 7-8 checked in suitcases and 7-8 carry on cases. Please keep in mind the maximum luggage capacity if you wish to form a group of 8 to ensure everyone and their luggage can be safely accommodated inside the vehicle. For optimal space, comfort and travel time, we suggest up to 6 persons staying at no more than 3 hotels. Looking for SHARED TOURS from CIVITAVECCHIA, LIVORNO, LA SPEZIA OR NAPLES PORTS? Find out how you can create your small private shared tours from Italy’s top cruise ports for wonderful shared memories and costs with new friends. Thank you very much for choosing Stefano’s RomeCabs for your Transfers and Tours in Italy! Buon giorno and welcome to Stefano’s RomeCabs, Rome’s leading company for private Airport Transfers, Civitavecchia Transfers, Day Tours and Shore Excursions. We have written extensively on our travel blogs about transfers, offering tips and advice that came from years of experience and serving tens of thousands of travelers and cruisers in Rome. Below we included some helpful blogs we’ve written in the past that include tips on booking airport and Civitavecchia transfers with RomeCabs. Just CLICK ON THE TITLES in red to go to the actual blog post. Booking your Airport and Civitavecchia Transfers with RomeCabs is easy. We have a simple booking form where you complete the fields based on the type of transfer you are booking, click to send, and your reservation request will arrive in our booking system. Our secretary on duty will process and confirm your transfer via email and your have your booking records along with a very detailed and informative confirmation email that you can keep a copy of with you for future reference. This blog shows you step by step how to book online. Whether you are arriving in Rome on a land trip or to begin your cruise, likely you will arrive at Fiumicino Airport. Fiumicino Airport is the largest international airport in the region, and it can be pretty chaotic. Unlike many airports, the baggage claims area where you collect your luggage at FCO (Fiumicino) airport is security restricted – meaning nobody without a valid airline ticket or special security clearance can access that area. Therefore, everyone who is waiting for friends and loved ones to arrive via FCO – including private drivers, must wait in a designated area in the main waiting hall of the arrival terminal. This helpful video shows you where your driver will meet you and also offers helpful information such as using luggage trolleys to easily carry your luggage out from the baggage claims, use the complimentary wheelchair service for those with mobility issues, and what to do in case your flight arrives ahead of schedule or if you experience delays. It’s a MUST for any RomeCabs clients to watch prior to arriving at FCO Airport. Arriving at Airport to go to Rome or Civitavecchia? Nobody wants to make mistakes when booking their Airport Transfers. Making mistakes can result in service not being able to be provided accurately, time wasted with email correspondences from the transfer company seeking to correct errors, or can create overall confusion. This blog focuses on 5 ways to book the perfect airport transfers in Rome for a seamless, stress free transfer experience. After offering 5 ways to book the perfect airport transfers in Rome, we can’t leave out Civitavecchia Port transfers! Afterall, many of our clients require BOTH airport and Civitavecchia transfers during their stay in Rome. In addition to providing helpful tips on booking your perfect airport transfers in Rome, we also dedicated a blog on 7 things not to do when booking a Fiumicino or Civitavecchia Transfer. By avoiding these common real life mistakes, you can avoid a heap of problems with your transfers. We have received many questions from clients over the years – and we are not referring to AM and PM times, but in terms of how far in advance? How last minute? Because there are risks of booking transfers too soon (before all your other plans are finalized) or too late (when you may not find availability), we offer some helpful times for the “Goldilocks” of the best and worst times to book your Civitavecchia Transfers. Thank you for choosing Stefano’s RomeCabs for your Airport and Civitavecchia Transfers in Rome. Please visit our website at the link below for a wide variety of transfers and tours. We look forward to welcome you to Rome! Buon giorno and welcome to Stefano’s RomeCabs, Rome’s premiere company for private Transfers and Tours in Italy. We strive to turn our visit to Rome and Cruise into Italy into your vacation of a lifetime. Each year more than 2 million cruisers and over 2,000 ships dock in the port of Civitavecchia to either sail on their cruise, return from their cruise, or on a day shore excursion. Civitavecchia is the cruise, ferry, and cargo port that serves Rome – it’s as such it’s considered the “Port of Rome”, even though it’s 1.5 hours away. Stefano’s RomeCabs have for provided tens of thousands of Civitavecchia Transfers, Shore Excursions, Pre Cruise Tours, and Post Cruise Tour to happy and satisfied cruisers who came to enjoy Italy and the Mediterranean on their cruise holiday. 10 reasons why YOU should also book your Civitavecchia Transfers with Stefano’s RomeCabs. With more than 12 years of continuous reliable, professional and quality service, Stefano’s RomeCabs is one of the most recommended companies in Rome for port transfers by cruisers world wide. We provide private transfers offering guests flexibility and customized service to serve your unique transfer needs. If your travel plans change last minute we are happy to make the necessary arrangements for your private transfer. We don’t shuttle our guests in crowded vans packed with maximum seating capacity to increase profit while compromising comfort and quality of personalized service. Our easy to book website and confirmation process ensures secured transfer reservations. Our website http://www.RomeCabs.com is rich with helpful and important information to prepare you in advance for your upcoming transfers. Our English speaking office staff are on duty 7 days a week to take care of your reservations, answer your email inquiries, and assist you with your existing reservations. We are also reachable by phone for any urgent matters regarding your reservation. 5 Travel in comfort and style in our air conditioned deluxe vehicles. Our fleet consists of primarily Mercedes minivans, sedans and station vehicles for optimal comfort and style. We take extra care to maintain our vehicles and spare no expense in ensuring they are maintained by the best Mercedes service center that operates at the highest industry standards. Our vehicles are also properly licensed and well insured. We do not cut corners or spare any expenses when it comes to the safety and insurance of our vehicles. Stefanos’ RomeCabs Drivers are professionally licensed with many years experience as professional chauffeurs, and have the necessary security clearance to access Civitavecchia port and the cruise ship piers to pick you up and drop you off right on the pier next to your ship for optimal convenience. Your Stefano’s Rome Cabs driver will have all your transfer information prior to your transfer so you don’t have to negotiate your transfer needs at the time of the service. Everything is organized in advance, there is nothing for you to do other than enjoy your relaxing journey to and from Civitavecchia Port. Our rates are competitive among our peers who provide the same level of quality service between Civitavecchia and Rome / Fiumicino Airport. In many cases, our prices are even lower. Quality and reliable service at fair prices has always been our philosophy and business model. Our prices include all applicable taxes, highway tolls, parking fees, and all road expenses required to provide the service. While quality does come at a price, the price should also be fair and competitive so our clients receive the best possible value. RomeCabs’ clients have the option to to pay in advance or on the same day without requiring credit card number or deposit. You are not required to give out your credit card number when booking, or required to leave a deposit. We trust you! If you wish to prepay in advance, you may do so safely and easily online via PayPal – keeping your credit card information safe over the internet. Because Stefano’s RomeCabs is also a Tour provider, with us you have the opportunity to upgrade your Civitavecchia Transfer to a Pre Cruise Tour or Post Cruise Tour to maximize your sightseeing opportunities in Rome or the countryside before and/or after your cruise. You don’t have to book multiple companies for your Transfers and Tour. Stefano’s RomeCabs can take care of your Airport Transfers, Civitavecchia Transfers, Day Tours, and Shore Excursions from Civitavecchia, Livorno, La Spezia and Naples with the same high level of expertise and quality service. CIVITAVECCHIA TRANSFERS: HOW TO MAKE YOURS EVEN BETTER! While most companies specialize in either Transfers or Tours, we specialize equally in both offering our clients a wide variety of services to choose from to complete their holiday in Italy or Shore Excursions in Italy. For more information about our services available on our website. Transfers between Fiumicino and Civitavecchia, and transfers between Rome and Civitavecchia. Transfers between Rome’s Airports (Fiumicino Airport or Ciampino Airport) and Rome accommodation. Day tours starting from your hotel in Rome to top travel destinations in the Roman Countryside, Umbria, Tuscany, and Amalfi Coast region. Full day shore excursions to Rome or the Roman Countryside from the cruise port of Civitavecchia. Full day shore excursions from Livorno Cruise Port to Florence, Pisa, and other exciting towns in Tuscany. The most popular shore excursion from Naples is Pompeii, Sorrento, and Amalfi Coast. Thank you very much for choosing Stefano’s RomeCabs. We look forward to welcome you to Italy and to show you beautiful places!